Movie name – Noor – Mumbai You’re Killing Me! 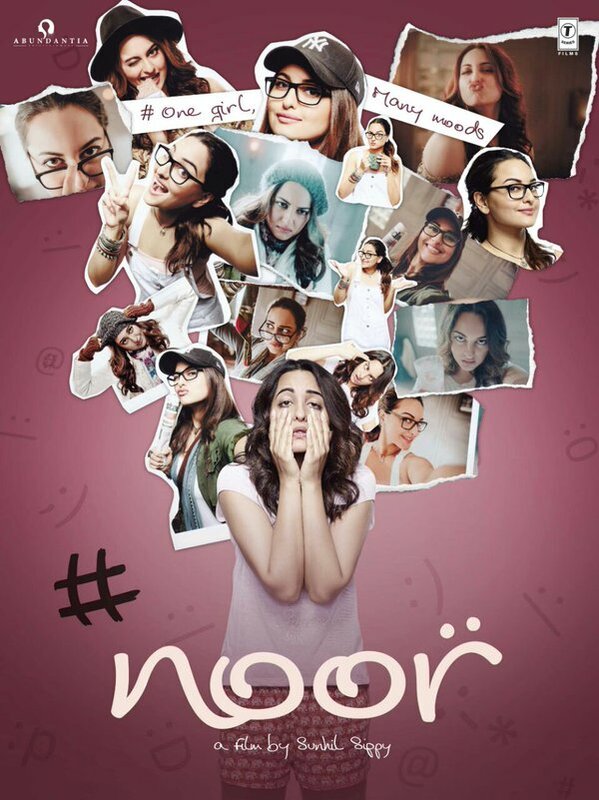 In Noor, Sonakshi Sinha plays the titular role of a young Mumbai journalist who strives to bring meaningful stories to light, while juggling her own personal issues with hangovers, weight loss and a disappointing love life. Sinha shines as Noor Roy Choudhary, a quirky 28-year-old journalist who lives with her father (played by the always excellent M.K. Raina) and an adorable pet cat. She spends her free time binge drinking with her two close friends, Saad (Kanan Gill, making his Bollywood debut) and Zara (Shibani Dandekar), while complaining about her life, job and the lack of suitable men. The first half of the film mostly passes by like a carefree romantic comedy, with the audience treated to the clumsy, humorous exploits of Sonakshi’s character. Dialogue writer Ishita Moitra Udhwani does well to keep the tone breezy and conversational, while the supporting cast are on-point with their performances. Noor comes across as relatable in her daily struggles, such as in her feisty interactions with her editor at work (Manish Chaudhary), who pushes her to cover trivial puff pieces instead of the more serious topics she would like to sink her teeth into. The shortcomings of the film come to the fore when the narrative turns more serious, and Noor’s maid (Smita Tambe) brings a major racket to her attention. It gives the protagonist her long-awaited opportunity to engage in an important piece of journalism, but the film’s depiction of professional news-reporting leaves much to be desired. Noor is based on Saba Imtiaz’s novel ‘Karachi, You’re Killing Me!’, which was critically acclaimed for its realistic portrayal of a journalist overcoming her personal demons to produce an award-winning report. The film does not live up to the book’s accomplishment on that front, as it provides a wholly unrealistic and uninspired take on journalists’ responsibilities in the real world. The film doesn’t seem to have a strong grasp of what it takes to be a journalist, nor does it inspire much empathy for the victims or much contempt for the offenders. Having introduced a relevant conflict worthy of investigation, the quality of writing slips as the stakes get higher, and not much is offered by way of resolution at the end. Sonakshi Sinha is exempt from this criticism as her performance evolves perfectly to fit the grim turn the story takes, and she deserves much credit for carrying the film on her talented shoulders. The film must also be lauded for providing us with a strong female protagonist with substance and a well-rounded character, unlike many of the other poorly developed female leads we have seen recently. The rest of the cast deserves kudos too, including Purab Kohli who makes a brief but important appearance as a dashing photojournalist who steals Noor’s heart, and Kanan Gill, who brings a cheerful light-heartedness to the screen in an impressive debut. Smita Tambe does excellently too in limited screen time, playing an impoverished lady trapped by a corrupt and unfair system. Director Sunhhil Sippy has impressed overall in his return to filmmaking after a 17-year hiatus, and hopefully he continues to make films at more regular intervals. Noor’s young and vibrant cast certainly makes the experience worth the price of admission, but the story falls short when it ultimately matters most.